Below is a post by Heba ElGawish, a finalist in Cairo From Below’s Our Urban Futures Ideas Competition. Here she explains her vision for Cairo’s urban future. If you would like to share your vision for Cairo, please write to us at CairoFromBelow@gmail.com so that we can feature your idea on the CfB site. The bicycle has been part of the Egyptian culture for generations, both as transport and a means of living (bicycles pushing vegetables and milk carts?). Our infrastructure is not able to support the ever increasing congested traffic anymore. It’s faster now to walk to places rather than take a cab or bus. Then why not bicycle there? It’s cheap (in the light of rising gas prices), it’s fast, and it brings people together through a community that strives for sustainability. As much as this idea sounds challenging for a city known for its ferocious traffic, by using the right implementation and outreach strategies it can actually be successful. Given Cairo’s flat terrain, biking from one place to another is not very demanding either. 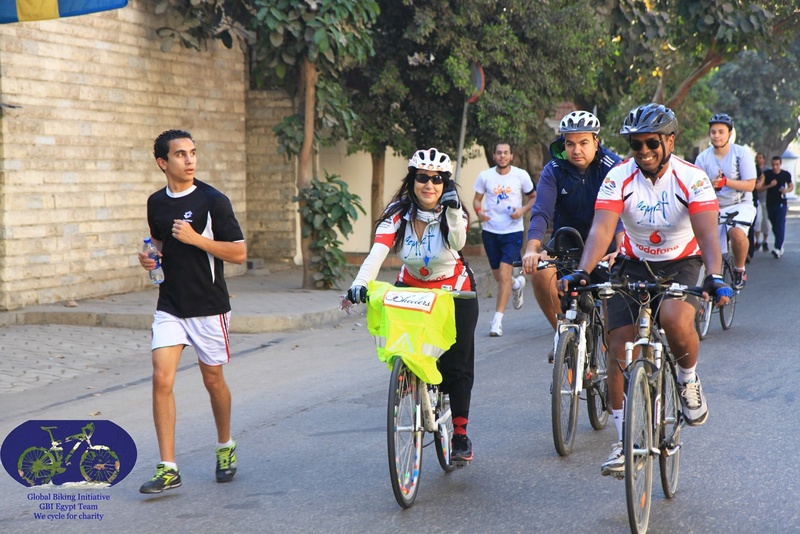 Cycling and running have already become popular in Cairo. 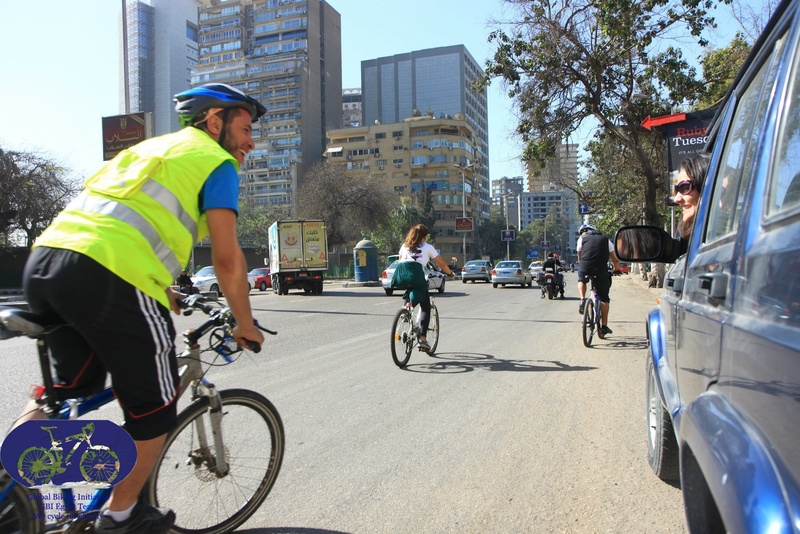 Over the past two years, the Cairo Runners and Cairo Chapter of GBI (Global Biking Initiative) have grown to include thousands of active members. People are taking control of their personal health and well-being and reclaiming their streets and public space. Mostafa Ahmed, A GBI Team member, said “I take the bike because it’s faster, healthier, and on top of that, you do something you love”. He also added that, “When the leaders of our GBI team started to go to their work by bikes, the next thing was other people bought bikes and started to cycle to work too, or leave their bikes at the Smart village, where their work lies, and cycle after work or early before work”. Cairenes are striving to embrace a healthier, more sustainable lifestyle. A bike share program in Cairo will facilitate these individual initiatives while promoting public health awareness. The bike share system is a convenient and affordable alternative to motorized transport for both residents and tourists to get around the city. Workers use it to commute to and from work, residents can run their errands, and it’s also a great way for tourists to explore the city. The bikes can be taken from any conveniently located station by swiping a smart card, or punching in a code, then returned to any station at the end of the trip. The smart card also acts as a way to track the bike and prevent theft. 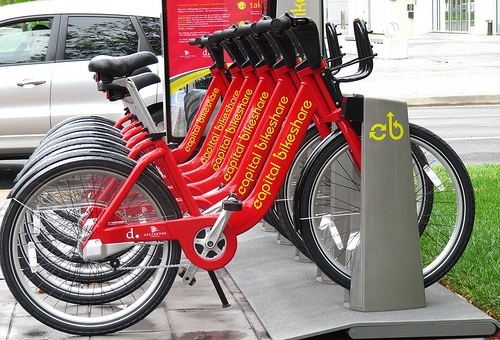 The bike share program also solves the first and last mile connection problem, especially where transferring from a metro station to a bus can be time consuming (e.g. reaching Heliopolis neighborhood to/from Saraya El-Qobba or Helmeyet el-Zaitoun metro stations). Another opportunity would be to connect Cairo’s East side to El-Zamalek and over to the West side without battling the highly congested traffic on the three bridges, 6th of October, El Tahrir, and 26th of July, that can consume over an hour to cross a 2 km stretch. The program has proven successful in many urban cities around the world. In Barcelona, bike commuting has increased from 0.75% in 2005, to 1.76% in 2007, while Paris has shown an increase from 1% in 2001 to 2.5% in 2007, the year the bike share program Vélib was launched (DeMaio 2009). Washington, D.C. which has recently been named number one in traffic congestion in the Unites States has the largest and most successful bike share program in the nation. According to the 2010 Census, 3.1% reported using bicycling as their primary form of commuting in Washington, D.C. The idea of a bike sharing system is not only a matter of commuting from point A to point B. The appealing aspect of this program to me is its sociological and societal impact on users and the city as a whole. – Alleviate pressure on public transportation: As intensive and multi-modal as the public transportation in Cairo is, it still remains very much congested with no uniform schedule to rely on. Introducing a bike share program will supplement and improve citizens’ ability to get around. – Opportunity to improve an otherwise deteriorating infrastructure: By incorporating bike lanes, and making streets more accessible to bikers, the city would have to revisit a lot of the traffic laws as well as improve road and street conditions which have been neglected for a long time. – Traffic calming strategy: Sharing the roads with bikers and pedestrians forces drivers to become more aware of their surroundings, slow their speeds down, and use signals to alert their intention. The successful bike share programs mentioned above provide guides and templates for new systems to be built upon. Annual memberships can be made available for daily commuters while a daily or weekly membership is offered for occasional bikers and tourists. Acquisition of membership needs to be accessible to lower income users, especially in light of the fact that the majority of this group might not have access to bank accounts and credit cards. Membership cards can be verified through national ID number and home address and can be purchased through special vendors. – Locate bike stations at convenient and high pedestrian traffic locations, such as metro stations and central bus stations. This can encourage riders to opt for biking instead of using the highly congested public transportation system. Bike share programs can be regarded as a form of salutogenic design in urban planning, where the relationship between the public space, bodies, and minds come together through cycling, to create a healthy, sustainable city. Heba ElGawish has, for the past 6 years, been working in Washington D.C. as a project designer for a structural engineering firm. She has volunteered on urban revitalization projects with Architecture for Humanity in both DC and NYC, as well as with PAO Architecture Summercamp in l’Aquila, Italy. In the fall of 2013, she will be starting a Master of Architecture program in Urban and Regional Design at the New York Institute of Technology. Her goal is to one day work on urban development projects in Egypt to create healthy, sustainable and equitable communities. their service in addition to wedding party. Not being a psychologist, my best guess would be some type of mushroom is at the root of the problem. I am from Alexandria and i think i have good ideas about how can a share system start here because Alex is more than ready for that. The problem is the fund or how can we get the bicycles !!. I think if there’s a good fund or sponsorship it would be easy to create this culture here :). Thanks for your enthusiasm, Walled. I’ll be visiting Cairo from Mid January to first week of Feb. Would be great to meet up and discuss your ideas further! Sorry about the typo, Waleed! I thought I would share with those reading this thread, a link to an artricle from Yesterday’s Atlantic Cities on a “Real-Time Bike-Share Map for the Entire World” It is a pretty cool tool. “City politics, like physics, is a zero-sum game. Progress in one direction produces resistance in another. But for advocates of bicycle infrastructure, the backlash to the boom continues to be a source of consternation. And it’s the tenor of the arguments against bike lanes and bikeshare programs – rather than specific complaints about funding, parking or community involvement – that’s inspiring all the angst. Thanks Nick for sharing the article. I’ve been looking for these kind of statistics on how the biking community, especially those using bike share, lacks diversity, especially among lower income communities. I’ve tried addressing the issue briefly, especially on making membership more accessible to those who might not have access to bank accounts. The fast that the bike stations are to be tied with the subway and bus network, this might make low income commuters more exposed to the system, which is a little different than many regions in the states for instance where the public transportation system is not only limited to the poor. Fortunately this program has been around for many years now. Lots of trials and errors have been made, and the system is far from being perfected, but it’s impact is unmistakable, positive more so than negative! and sure if the project started with all metro stations would be great but some blocks might not be friendly to bikers testing a small scale could change the way we think about such project. there is a start up for bike sharing in alex called “mesta3gel ” they are doing some good work there. Thank you. I did not know about the “Mesta3gel” Project. I’m actually going to be in Alex the next few days, so maybe I can try to get in touch. I believe the optimum way is to locate a bike station at each metro station with a 3 to 5 km radius connection points. Focusing on one or two particular zones can also be a good way to go. Thank you for your feedbak! Thank you for the great post. I think that right now the need for bike-riding and bike-sharing in specific has manifest its need even more with the exponentially increasing prices of gasoline and unbearable traffic. Yet, implementing a bike-sharing program is a very tricky and , most of the times, expensive business. There maybe best practice guides for implementing bike-sharing systems, yet every city is a case of its own! I have been working on planning a bike-sharing program taking all the parameters that we have here in Cairo into consideration. I would love it if we sat down and had a little chat about bike-sharing and how to make it feasible and viable here in Cairo. Many thanks for this excellent post. Those in NYC just got a bikeshare program on Monday and by all accounts has been pretty successful so far.